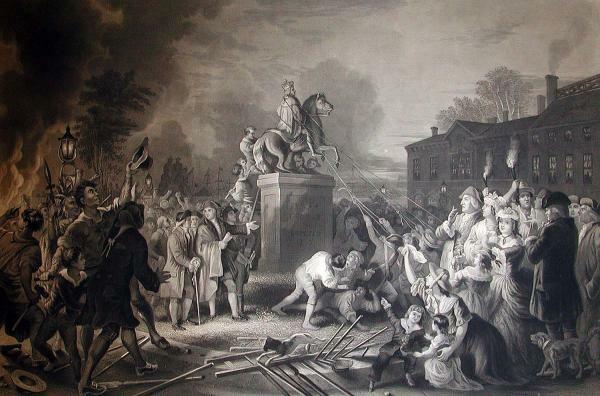 Tearing down the statue of George III destroyed monarchy as a form of government everywhere, the world over. Two years ago, I posted a photo of a coffee mug that bore a text with whose premise I disagree. I found it humourous, but I disagreed with it. I suppose that an activist type might claim to have been “offended” or “triggered” by it. One of my acquaintances reacted in a way that I found odd and surprising: this person suggested that I should have destroyed the mug. First, it was not mine, so destroying someone else’s property at the office probably would not have gone over well. Second, destroying something simply because it symbolizes something with which I disagree would be incredibly puerile, infantile, emotive, and stupid. It would also accomplish nothing. Third, I then came to suspect that this person believed that destroying the object would somehow destroy the idea itself. I watched an interview with Stephen Fry, and the disjointed thought that first occurred to me in amorphous form finally turned into something more concrete, like how a super-cooled liquid will solidify instantly around a solid object introduced to its environment. Fry adds at 8:03: “But to remove his statute strikes me as being stupid. The way to fight colonialism, and the ideas behind it, is not to pull down statues. It is actually to reveal, to say who he is, ‘This is who this man was: look at him. '” In other words, if you disagree with colonialism, then you should explain why in a rational argument instead of tearing down a statue of someone who represents colonialism. Censorship is based on the primitive and infantile belief that destroying an object which represents an idea (like a book or any other written thing bearing the text of an argument, or a statue or idol or other non-textual visual symbol) somehow thereby also destroys the idea itself. Censorship therefore signifies a triumph of primitive, infantile, emotive volatility over reason and rational argument. What I’m describing here has been identified by psychologists and evolutionary biologists as a primitive form of cognitive bias, sometimes known as “Appearance Equals Reality.” The object that propagates or represents an idea that one hates becomes the idea that one hates. Therefore, destroying the object will destroy the idea. Since it is a cognitive bias, it is, by definition, irrational and instinctive. Dan Gardner in his book Risk exposes this cognitive bias through an interesting personal account of his experience of being pick-pocketed in Nigeria. In his self-described agitated state at that moment, he became obsessed with tracking down the thief who stole his wallet — despite the great physical risk to himself with no material gain– mainly because he wanted to take back a photograph of his children that had kept in it. He writes that the following morning, he realized how irrational his fixation was, given that he had other photographs just like it back home. He adds that he had reacted on instinct: the photograph of his children was his children. He reacted the way that he did the night before because he was trying to rescue his children, and not merely take back a photograph of his children. I would therefore posit that impetus which some activists demonstrate in their desire to ban and censor certain material that either expresses (as in writings) or represents (as in a statue of Cecil Rhodes at Oxford University) ideas with which they disagree or find “triggering” or “offensive” ultimately stems from this primitive cognitive bias of “Appearance Equals Reality.” Subconsciously, they believe that destroying or banning something which propagates or represents an idea will destroy the idea itself and thereby prevent them from having to reckon with or deal with that idea, and prevent others from ever independently coming up with the same or a similar idea in the future. This cognitive bias is sentimental and infantile, because acting out on this instinct allows someone to throw a tantrum and destroy or burn something instead of engaging with the material and devising a reasonable argument on why the ideas contained or implied therein are bad and ought to be rejected. Censors are, above all, barbarians. Like the Huns and Visigoths who plundered cities in the Roman Empire, they would sack the city of knowledge, set it ablaze, and raze it into the dust instead of contributing their own ideas to refute existing ones. I totally agree in the continuing madness of censoring the past. I think the recent trend of historical censorship is both wrong and worrying. As the now famous opening line of L.P Hartley’s novel proclaims, “The past is a foreign country: they do things differently there.” People held different attitudes and beliefs that can be utterly incomprehensible to our own. Why wouldn’t they? Our ancestors lived in a different society, a different international context, with utterly different technologies; until the advent of the railways, most people never ventured more than a day’s walk from their homes. Canada may have existed 200 years ago, but to all intents and purposes, it is not today’s Canada. Our understanding of the past cannot be viewed through a modern prism; it is both illogical and ahistorical. We can condemn past injustices for what they are, but a more balanced and historical approach is to judge people and their actions by the standards commonly adhered to at the time. If we can take down Rhodes’s statue in Oxford, then should we not remove any existing statues of Roman emperors? The Roman concept of humanity and morality, for example, differed significantly than our own. Where does censorship end and historic vandalism begin? I sometimes wonder whether our society’s exposure to historical dramas in popular entertainment such as ‘Little House on the Prairie’ or the ‘Murdoch Mysteries’ has skewed our view of the peoples of the past. These programmes self-consciously project late 20th or early 21st century beliefs and values onto the 19th Century situations: absurd. The risk is a totally false view of what history is; that the past really is a different country. I found this quite interesting. I would contend though that to confine censors to the safe confines of barbarism and of not contributing any ideas of their own is inaccurate, and may underestimate the censor’s danger, as well as being a poor starting point for convincing them otherwise. I believe the motivating force for censorship is not a sort of nihilistic barbarism, but rather fear. Yes, the censor does generally (and wrongly) believe that destroying the physical manifestation of the idea destroys the idea itself. But this does not explain the whole story. For we must ask why the censor wishes to destroy the idea. It is nearly never the case that censors wish to destroy all ideas and burn the city to the ground. Rather they nearly wish to expunge those ideas which are fearsome to the ideals they hold, while exalting those which they hold dear. They are not the Huns then, but the Montagnards, demanding ever greater purity of ideas and purging those who do not move in lock step. Good point. The purges themselves are normally partial. But the accumulation of many purges could destroy the edifice itself.